Rigoletto seems to be a proving ground for Houston Grand Opera. Its 2009 production let several new singers try on Verdi’s challenging roles for the first time, to great success, and that practice continues in the current run. The drama has been intensified by Harry Silverstein’s tauter direction, upping the tragic air, especially in the early acts. Uliana Alexyuk, filling in for an indisposed Elizabeth Zharoff, conquered the vocal and dramatic complexities of Gilda. Already impressive in the small role of Ivette in the concurrent run of Weinberg’s The Passenger, Alexyuk’s easy coloratura and commanding stage presence were gratefully allowed to give full flight. If her earliest passages showed the slightest hint of nerves, her exquisite delivery of “Caro nome,” enthusiastically received by the audience, allowed her to blossom in the second and third acts. Indeed her vocal quivers and hesitant pacing at the door of Sparafucile’s inn were spine-chilling. Ryan McKinny’s handsome features were skewed into a physically emaciated, lopsided Rigoletto. His voice, however, was healthy and eased through the role’s demands. His singing in German and English repertoire at HGO has given us an appreciation of his growing vocal stature, but in smaller roles. Like Alexyuk’s turn in the spotlight, McKinny made the most out of his, and the duo made a touching father-daughter pairing. Rounding out the trio of leads was Stephen Costello, singing for the first time at HGO. He had the requisite vocal and physical swagger for the Duke, and he seemed intent on making his big arias (“Questo o quella” and “La donna è mobile”) fit into a linear narrative instead of having them stand apart as mere showstoppers. The result was more subtlety and less grandstanding in these two moments, the feeling more genuine and organic to the Duke’s character. 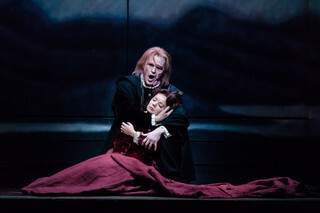 Dmitry Belosselskiy’s mammoth bass voice resulted in a commanding, unrelenting Sparafucile, while Carolyn Sproule’s Maddalena was deliciously devious. Choral contributions also added to the thrust of the drama, which was given excellent momentum by Patrick Summers in the pit. Some of the idiosyncrasies of the 2009 production were edited out, which strengthen the overall impressions. While the scenery in the first two acts remains somewhat nondescript, the third act has been tightened and darkened, adding a more pronounced tragic exclamation point to the dramatic arc.